The Pêche Mel Scaldis was born as a popular student cocktail. Now, it is a combination of the Scaldis Amber and a peach beer. 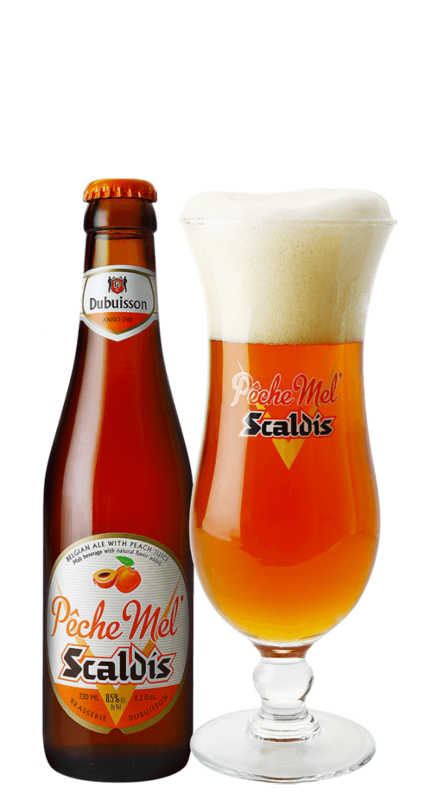 The Pêche Mel Scaldis has been brewed since 2009 by Brasserie Dubuisson. It is produced with the same care and attention as the other Bush beers, with its own original recipe containing natural peach extracts. The Pêche Mel Scaldis is highly recommended to lovers of fruit beers with character. The natural fruit aromas and extracts provide a beautiful harmony with the bitterness of the Scaldis Amber, creating a full-mouthed and completely balanced beer. The Pêche Mel Scaldis is a filtered, top-fermented beer with an alcohol volume of 8.5%. Without doubt, this is the strongest Belgian fruit beer. The Pêche Mel Scaldis has a beautiful amber colour. In the aromas you will detect a hint of peach juice with a touch of mango. The Pêche Mel Scaldis has a rich array of fruit aromas (yeast esters and banana), that return in the taste with added touches of caramel. There is a trace of sweetness that never becomes overpowering.